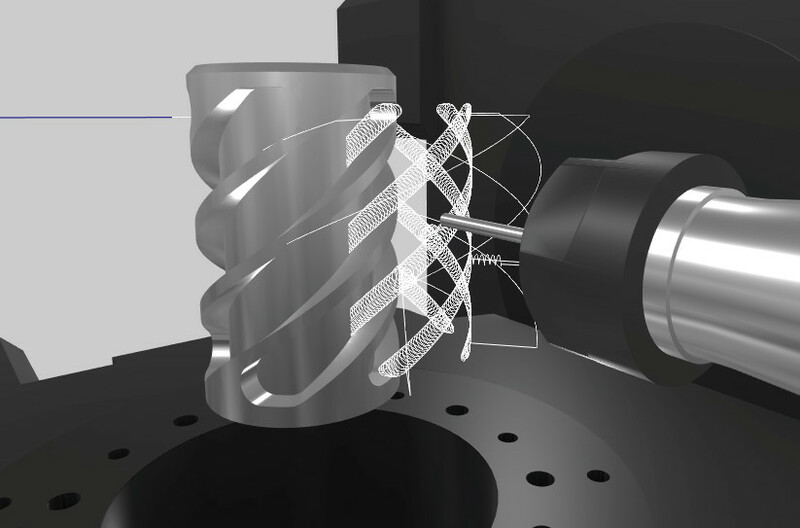 The Pocket NC V2 mill uses an in-house designed and produced bearing system on the rotary axes. The performance of the bearing system has met expectations, but the assembly has been more cumbersome than anticipated. 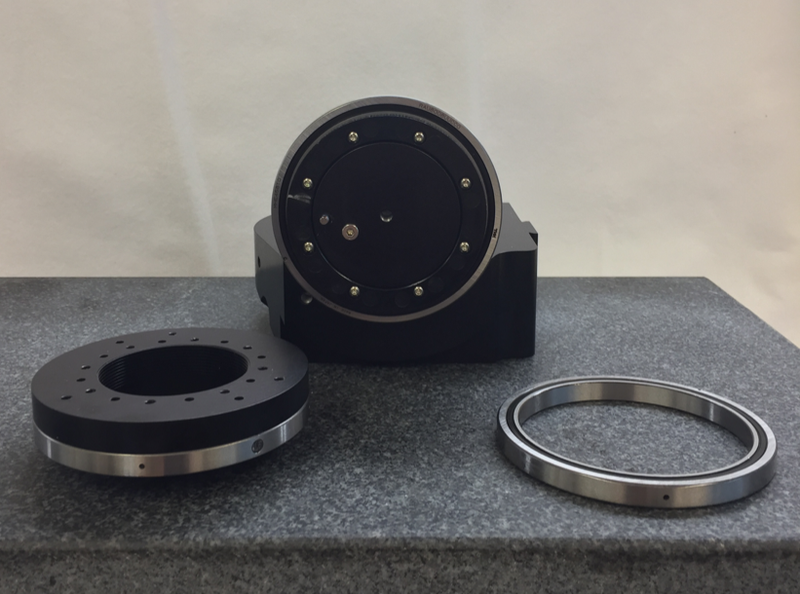 Ultimately we made the decision that we would be unable to adequately scale the production of our machines without a change to the rotary axes bearing system. So we chose to switch to using a THK Cross-Roller Ring bearing. This bearing offers the ability to carry a load in all directions: axial, radial and moment loads are supported. The V2 now achieves a higher level of rigidity in the rotary axes of the machine without increasing the exterior dimensions of the Pocket NC. The practical results of this change in the bearing are increased rigidity in the rotary axes, decreased runout of the A and B axes, increased strength of the rotary axes, as well as an improved production process that allows us to produce a more consistent product in a scalable fashion. The rigidity of the of the rotary axes was improved by a factor of 2 and the run out of the rotary axes was decreased by a factor of 4, the strength/force of the rotary axes movement is about double what is was before due to less friction in the bearing. All this adds up to a more rigid machine which results in improved machining performance in material removal rate and surface finish. As a growing company we are constantly finding ways to improve our processes and products. One area in where we have been innovating recently is our calibration process. Our machines have always undergone an extensive calibration and testing procedure before leaving our shop to ensure that they meet our stringent specifications. This process involves taking several hundred measurements and observations. In late Spring, we discovered that our calibration of the rotary axes on the machine was a weak link in our system. Our system relied on checking only two points, the home position and one other point in the rotation. This ensured that the machine was in the desired location at the home position as well as the second point, but it told us nothing about whether the machine was accurately indexing between the two points. We developed some new fixtures that allowed us to check 8 points rather than 2. This revealed that there could be errors of up to 0.5° at points in between the two points that we previously checked. We immediately sought to discover the source of the error. We ultimately determined that it was due to some inconsistencies in the manufacturing of the gears that we build in-house. We made some changes to our manufacturing process and were able to correct about 50% of the error, down to a max error of about 0.25° but this wasn’t good enough. 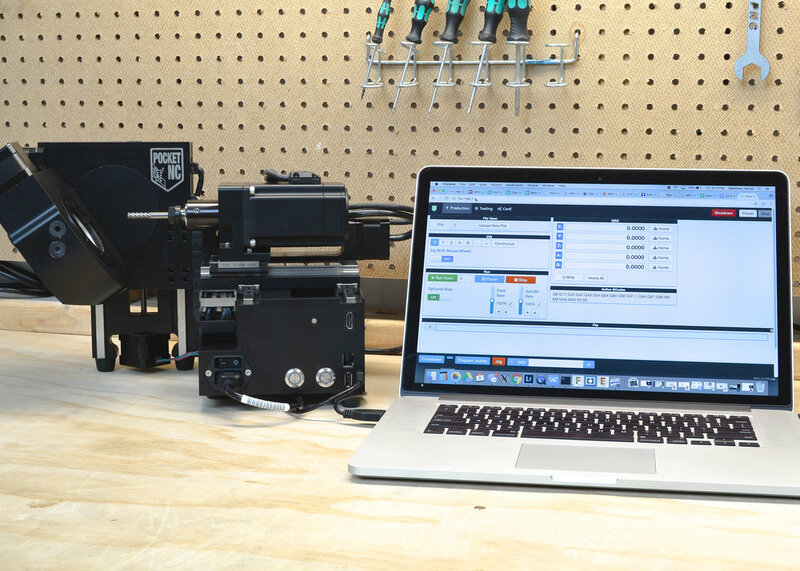 Our software developer discovered that we could use a tool built into Linux CNC to compensate for inconsistencies in lead screws allowing us to correct for inconsistencies in our machine’s rotary axes. We continued with our manual measurements at 8 points and added rotary axis compensation at 4 points in the travel of both A and B. This resulted in another decreased rotary position error of about 50% down to about 0.12°, but we still weren’t satisfied. 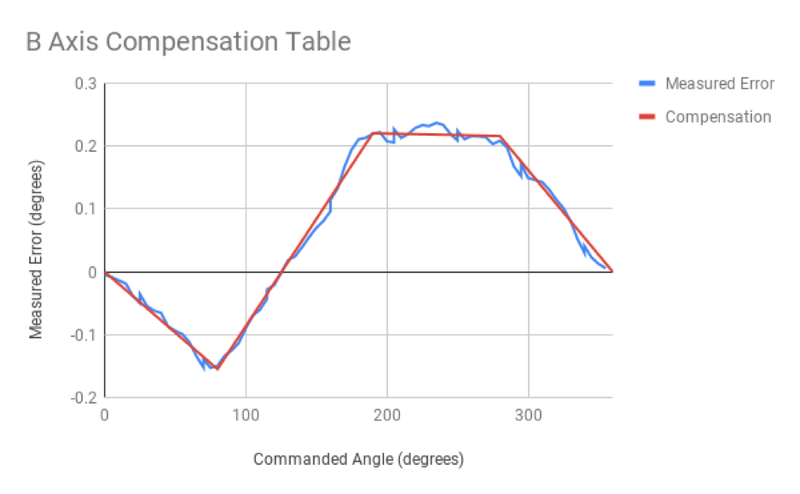 We needed a way to measure the angular position at more than 8 points in the rotation. We could have made another fixture and kept on using the dial indicator, but we recognized that it wasn’t going to be a realistic solution for the long term due to the time required to take hundreds of manual measurements. We needed a way to probe the machine. This video shows one of the updates to our calibration process on the Pocket NC V2 using a Renishaw probe. This video captures the calibration of a couple points on the B rotary axis. Note, this is not yet an option we sell on the Pocket NC V2. Enter the Renishaw probe. Our software and hardware team have been working closely together on developing a solution that delivers consistent, accurate results. 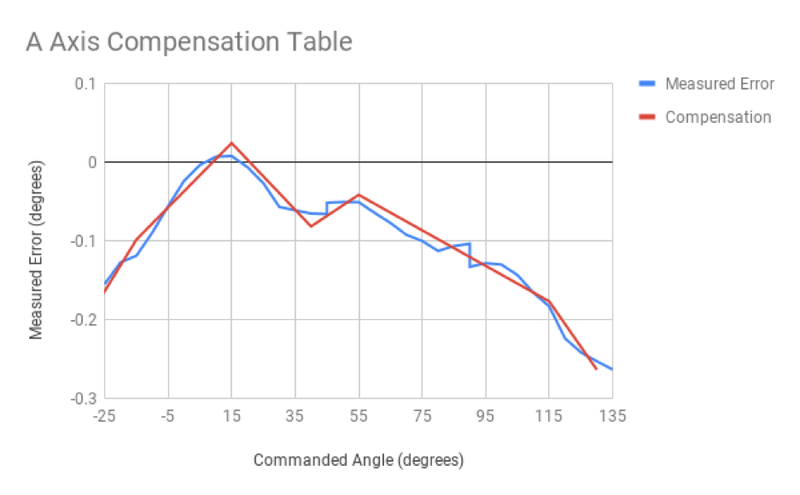 There has been a lot of learning along the way, but we are excited to say that we now have the capability to probe the machine at any arbitrary number of points and create a custom compensation calibration table for each machine. We are now able to compensate the rotation of the A and B axes with enough precision to reach rotational accuracy of 0.05° at every angle. We recently started developing a simulator for Pocket NC machines. We have a number of goals for the simulator, but our main intent is to make it easier to use our machines. 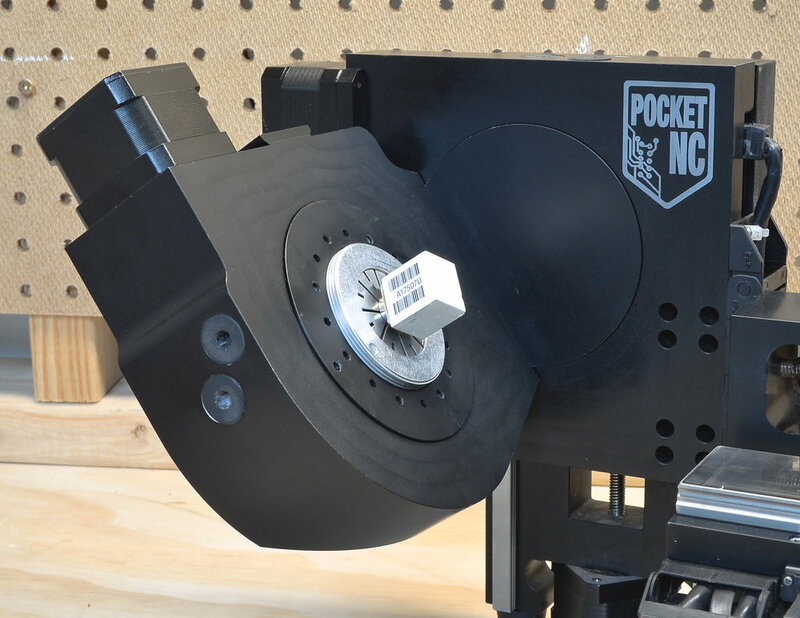 The Pocket NC is one of the most affordable and accessible 5-axis CNC machines out there, but there are a number of stumbling blocks for people who are just getting started with 5-axis machining. The simulator will be able to catch common mistakes such as the tool isn’t long enough at the current part orientation or the tool path origin isn’t correctly positioned at the machine origin. Getting to the bottom of those pesky limit errors will also be much easier. One of the biggest benefits of the simulator, though, is peace of mind that the machine will cut how you intend it to. You’ll be able to see your GCode program run virtually, with each joint of the machine behaving like the real version. You’ll be able to learn how to use the machine without wasting material or breaking tools, a huge cost savings in the long run. We’re planning an official release this Fall, which will be available to use with all past, present, and future V2 machines. Look for an official announcement this Fall for more details. Which leads us to price, after careful consideration we’ve decided to implement a price increase starting September 1, 2018. In addition to the above, these machines will also include a 1-year warranty instead of a 3-month warranty. The terms and conditions will be the same as that of our current warranty, it will simply be extended from 3-months to 1-year. As noted in this update there is certainly value that has been added into the machine; however, we have also experienced some vendor price increase. While we do source as many parts as we can from the US, we do get a few components and materials from overseas and have seen a price increase of these items due to tariffs up to 25%, which has increased our cost of goods. The new price of the V2 will be $5500. We will keep the lead time active on the website online store for the Pocket NC V2, so you can also check there. Should you have any questions regarding this change in price, please contact us at info@pocketnc.com, and we’d be more than happy to talk with you. Thank you for understanding that this price increase means we can continue to maintain the superior standard of our products and customer service that you’ve come to expect from us well into the future. *Machines shipped after June 1 had the rotary axis compensation calibration process. If you purchased your V2 machine prior to this and have any difficulties with axis alignment, please see a tutorial here. Note, it is the worst-case scenario that is 0.5 degrees, and most were far less. Please email us at info@pocketnc.com if you have any further questions.